The East Village Association takes an advisory membership vote Monday, May 4, on a zoning change for 1916-24 W. Chicago Ave. The meeting starts at 7 p.m. in the Happy Village Tavern, 1059 N. Wolcott. The proposed Winchester restaurant, to be located at 1924 W. Chicago Ave., has been previously presented to this community. We are pleased to advise that the West Town Chicago Chamber of Commerce and the East Village Neighbors have pledged support to this exciting project. floor will have quiet use and enjoyment of the premises as well. add brick to its construction; and install a stronger fan to ensure that the exhaust is taken up and away so as not to disturb patrons, tenants and passers-by. Furthermore, the bricking of the facade of the stack will not only improve functionality, but also appearance. 1901) parking is not required by code. However, we will provide a full Valet Parking Service for patrons of the establishment. The property at 1916-24 West Chicago Avenue, has two separate zoning designations on a single parcel of land. For example, the majority of the subject property (the front two-thirds of the parcel) is currently zoned B3-2. However, the rear third of that same parcel is zoned RT-4. It has recently come to our attention that the subject parcel, along with five other parcels with frontage on Chicago Avenue from 1900 through 1924 W. Chicago Ave. (from Wolcott to Winchester), have been incorrectly rezoned. According to the City of Chicago, these parcels were rezoned in error, because a single parcel of land has more than one zoning designation on the same lot. Instead of changing the zoning designation along the alley line, as was done on either side of this block, the change in zoning from B3-2 to RT-4 occurs on the rear third of all the lots. We are requesting this zoning change to correct this error so that the property at 1916-24 W. Chicago Ave. has one complete zoning designation instead of two. The zoning designation that we are requesting already exists on the front two-thirds of the parcel, a B3-2 zoning designation. This zoning designation already exists on the majority of the property, as well as on the other parcels up and down Chicago Avenue. 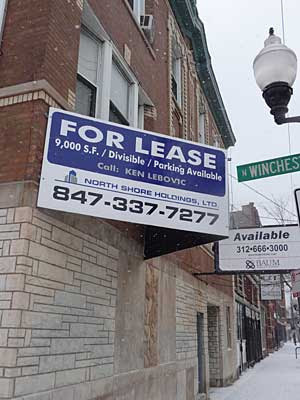 The requested change in zoning will bring this property in line with what already exists on both sides of Chicago Avenue from Damen Avenue to Wood Street. We are grateful to have the opportunity to address any remaining questions or concerns and look forward to seeing you at the May 4 meeting. Can't wait for the opening. I saw their proposed drawings and they look great. I am so glad someone is willing to improve the look of that building, and a nice restaurant coming as well. I can't wait. The current proposed capacity is 250+. That is bigger than Boundary. That is too large for that location. I think this is a great idea! Finally someone is going to improve the look of this building. I'm tired of watching everything like Natalino's, Branch 27, Five Star, Old Oak Tap, etc open to the east of Ashland and west of Damen. It's about time we get something new along our area as well! I am in full support of a business that is confident in the neighborhood and willing to not only improve the street but also employ people! They cannot be open after 2am. They are not seeking a late license and the city would never allow that anyways. In their plans in the last EVA meeting there is no stage. I think people should get the facts straight. I am glad these owners are being active in developing something in this economy which will draw positive attention to future improvements in our tired area. WAKE UP PEOPLE! Looking forward to live music on the patio and 4 AM drinking and lots of fun. who cares about food! The city does not allow a late license. This and any other future restaurant or taverns will not be allowed to operate past 2am. My local friends and I are all in favor of this place opening soon. YEAH 4 AM drinking on the outdoor patio and 5 AM on Sat. These owners will be able to get the 4 am license!